Xe Om, Pho: Oooh Crumbs! 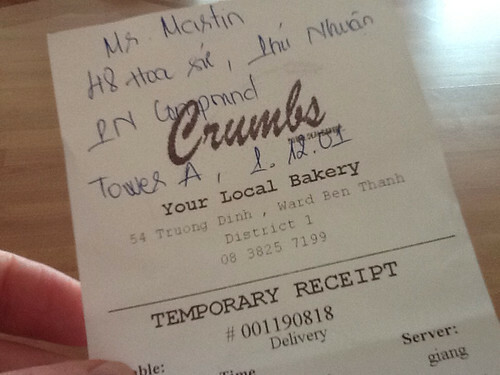 Do you know Crumbs Bakery here in Saigon? When I remember to order online on a Friday night, I love getting a delivery of warm, fresh bread on Saturday mornings. You can order any day of the week, of course, and they deliver the next morning - but I think it's extra special to get a delivery on the first morning of the weekend. It reminds me of when my mother used to send us down to the dairy on Sunday mornings for a hot Sunday loaf. I don't think you can get those at the local dairy any more (showing my age, here!). Anyway, Crumbs is better than Baker's Delight, because Crumbs is HERE. And, not only do they make wonderful fresh bread - but they're the only joint we've found in town that can make pies. 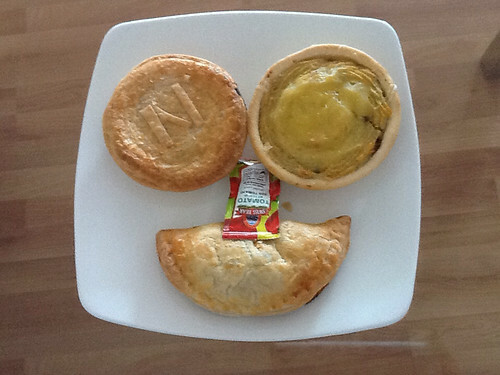 This morning we had a craving for pies for breakfast. And after a protracted argument about who should go on a motorbike and fetch some, we had a brainwave and rang them up to ask for a delivery. They arrived still hot and delicious - just in time for Sunday brunch. The woman on the phone spoke pretty good English, too. Thanks, Crumbs, for preserving Marital Harmony in the Martin household for one more day! Dear Phil - Duck and Mango Curry?